Three people are dead after a fiery rollover crash Wednesday morning in Dallas, police say. All eastbound lanes of Interstate 30 were closed between Dolphin Road and Ferguson Road at the time of the crash. The collision involved an 18-wheeler and another vehicle. Tow trucks began clearing the wreckage by about 6 a.m.
Traffic was diverted at Dolphin Road. 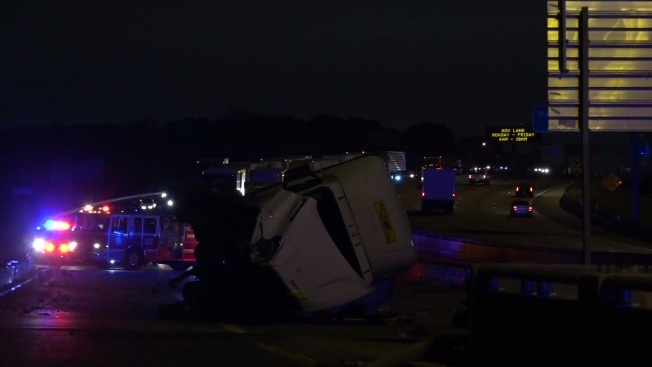 On Thursday, the Dallas County Medical Examiner released the names of those who died in the crash as 22-year-old Brian Amaya, 21-year-old Maria Saavedra and 36-year-old Ignacio Garcia.